During the first week of August, Chad and I were in Haiti on a mission trip with 14 students and 4 other adults with Adventures In Missions. As I've mentioned, it was the most powerful and meaningful week of my life. Because of what God accomplished in, around and through our group, I've been processing and writing my response to those experiences here on my blog. This is response #5 of 9. You may want to start from the beginning if you're just jumping in. Before going to Haiti, I felt God was encouraging me to use my photography as a tool in some way. I had been following some of my favorite photographers' work and interviews. Jeremy Cowart's Voices of Haiti was especially inspirational, as well as the work of Esther Havens, a humanitarian photographer who loves the Lord. In an interview she did with Matt Brandon, I was really compelled by her words and her story. Esther talked about how it is easy for people (especially Americans) to go to a third-world country with a big camera as if on a safari, capture all the dirt, flies and sadness, and take home photos of people that bring tears to the eyes of viewers. She talked about how "stealing photos" of people in this way was only exploiting them and their situation so that you could have some kind of "National Geographic, award-winning photograph" for your portfolio. She challenges people to take a photo of someone ONLY if you have genuinely gotten to know them first; if it's going to be used in a way that would glorify or help that person in some way and bring honor to God. Wow. I loved this perspective! So selfless and purposeful. Gustavo Gutierrez once said,"You say you care about the poor. Then tell me, what are their names?" 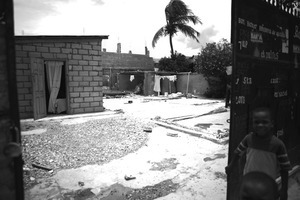 If I was to use my skills as a photographer on a mission trip in Haiti, I needed to truly get to know people first, dig for their profound stories as it was comfortable, and then ask them if I could take a photo of them so I could continue to tell their story when I returned home—and then actually tell their story. In recalling all of this, I knew on that Thursday I needed to go somewhere where I could be in a position to learn the stories of the Haitians and make the most of the opportunity. I decided to go with Devin, Josh, Zach and our translator, Watson, into Carrefour. So glad I did! We made 3 meaningful stops that morning. One of them was to the house of a woman named Destines, whom Devin and a couple others had met earlier in the week. She had made an impression on them so they wanted to go back and see her again. It was easy to see why… Destines is easily the strongest woman I have ever met. Her entire home was destroyed by the earthquake in January 2010. Miraculously, no one was injured. A missionary organization came in and rebuilt a single room for her where her house used to stand—you can still see the ground and how much surface it had covered. She raises one child of her own and has two cousins live with her as well in this one, small room (which is enough to contain one bed, a couple plastic chairs and a food storage/preparation area). Destines has no job. She is completely dependent on the Lord, praying for everything. She spends each day on her knees asking for food for herself, her child and two cousins. Some days God answers her prayers, providing for her through some connection, so she gets food and they eat. Other days she doesn't get food, so she remains on her knees, praying for the next day. As the 5 of us spoke with her, I sat on the edge of her bed right next to the door. The breeze was gently blowing the curtain in and out so I could see a couple children stooping to fill their empty jugs with water outside. I could see broken bricks and small pieces of rubble on the ground where her house used to stand. I couldn't help but wonder, "How could you stay here, being constantly reminded of everything you used to have? How painful that must be…" But Destines told us it didn't matter that she had lost everything in the earthquake. She still had her family and she was confident God would provide for them. She praised God for his goodness and for what she still had! Her faith was incredibly strong and she didn't seem the least bit worried or sad about her circumstances. Tired, maybe, but not sad. We were able to leave her with plenty of rice and prayed over her. We also let her know how special she was, how strong she was for her family, and how inspirational she was to us. I will never forget this beloved woman of God. From one, simple conversation with Destines, I saw what it looked like to put your total trust in God. Not some of it—when it is easy or when you think about it, but ALL of it—especially when it is difficult. You see, anything less than that really isn't "trust" is it? In seeing a tiny glimpse into the life of Destines, I learned about the importance of quality time spent on your knees every day and the power of prayer. No matter how distracted we become by the "stuff" in our lives, no matter how awful our circumstances seem, Jesus really is all that we need. You can fully rely on Him. Read the next response (#6 of 9).